Launch of a commercial Earth-imaging satellite aboard a Delta 2 rocket originally scheduled to occur next week from Vandenberg Air Force Base in California will be pushed into early September. Liftoff of the GeoEye 1 satellite had been targeted for August 22. But difficulties arranging a critical downrange tracking asset prompted launch managers to postpone the flight until September 4. The "Big Crow" telemetry-relay aircraft is unavailable to support the launch. 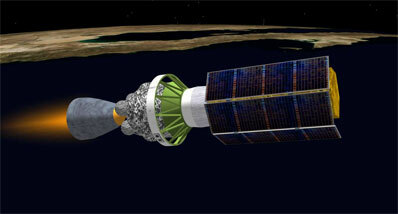 A mobile tracker is needed to receive the stream of data from the Delta 2's second stage after the rocket flies beyond the horizon of Vandenberg's ground station. As a replacement to the aircraft, officials are booking the services of an instrumented ship known as an Ocean-going Transportable Test and evaluation Resource, or OTTR. The vessel will be positioned in the Pacific Ocean well downrange from the launch base to cover the initial firing of the second stage that puts the rocket into a preliminary parking orbit around the planet. The GeoEye spacecraft remains inside its processing facility at Vandenberg. Its transfer to the pad at Space Launch Complex 2 was delayed last week due to the tracking support concerns, as well as ongoing qualification testing of a Range Safety antenna that should be wrapped up in the next few days. Based on the new launch date, the 4,300-pound craft will head to the pad next week for mounting atop the rocket. Liftoff on September 4 is targeted for 11:50:57 a.m. local time (2:50:57 p.m. EDT; 1850:57 GMT). The satellite will orbit more than 400 miles above the planet and produce the sharpest images available from a commercial spacecraft, with a resolution of 0.41-meters or 16 inches for black and white imagery and 1.65 meters for color imagery. Customers of the imagery are expected to include the U.S. government, commercial firms, environmental monitors and various industries such as air and marine transportation, agriculture and mining. Headquartered in Dulles, Virginia, the GeoEye company was created in early 2006 by merging satellite operators Space Imaging and OrbView. The new GeoEye 1 satellite will join the company's Ikonos and OrbView 2 satellites currently in operation today.